← Don’t they have enough? Data – Security – Always On Devices – Stuxnet – Identity theft. Words that spring to mind these days when someone mentions the Internet. For all the talk we hear about identity theft and data loss and Trojans and Hijacks, it looks like there are a whole lot of insecure devices out there in the big bad WWW. Lets look at that in reverse. There is the Internet and we are running out of addresses and so IPv6 is being rolled out. But exactly how many of the existing addresses are ‘actively’ used? Read that last line again. 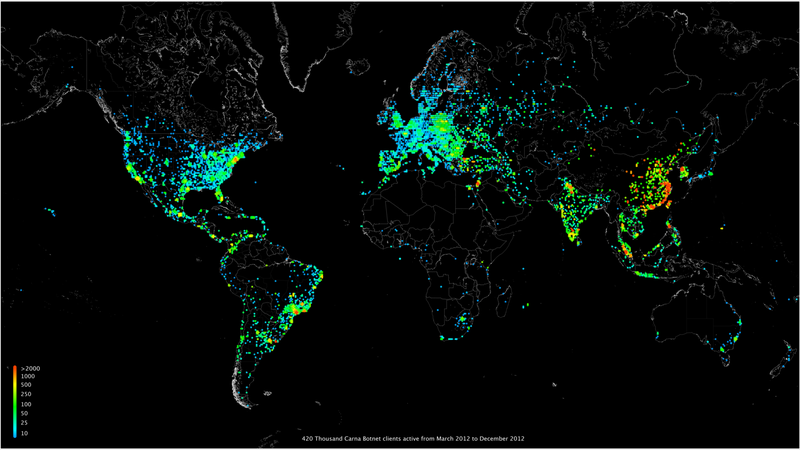 2.3 Billion addresses showed no sign of usage. Moving on, how insecure are the devices connected to the net. Remember that cable guy who set up your router and you were so eager to start downloading movies that you never really bothered to change the administrator password? Well the good news is – you are not alone. Note: Emphasis is mine, but you get the idea. The picture at the beginning of the post is the snapshot of the 420k instances of the Carna bot (yes, the bot used was called Carna, very apt no?) running on devices across the globe. I couldn’t find data points to determine exactly how many instances were running in each geography, but the colour codes look alarming for a country like India with such low broadband penetration. Find time to change that password yet?